Well wrestling fans, the time is finally here. WrestleMania week is always the most exciting week of the year for wrestling fans. WWE’s mega event takes place Sunday night, but promotions from around the world will also take advantage of the influx of fans. If you’re in New Orleans this week, chances are you’ll stumble across some type of wrestling event. 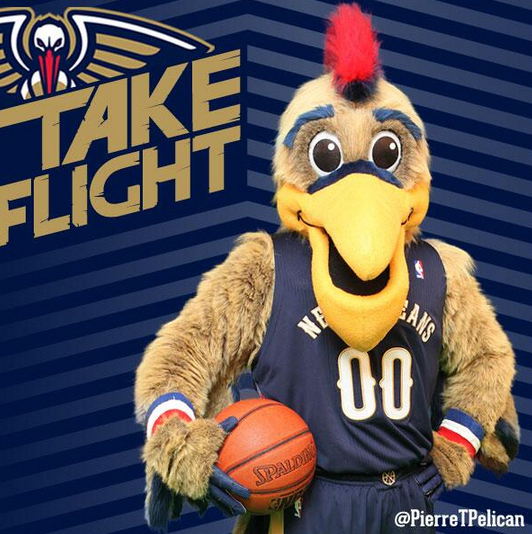 Thousands of fans will descend upon the Big Easy for what should be one hell of a week. On paper, WrestleMania 34 is one of the best cards of the modern era. Cesaro and Sheamus (C) vs. Braun Strowman and ?? That is one hell of a card. The best part is that there’s something for everyone. On the pre-show there’s going to be insane, high flying action with the cruiserweights. Battle royals are always a lot of fun, and will be a good showcase for men and women who wouldn’t have otherwise been on the card. The main card features the return of Daniel Bryan, the debut of Ronda Rousey, AJ Styles vs. Shinsuke Nakamura for a major WWE title; John Cena vs. The Undertaker could happen, plus Braun Strowman has to find a partner if he wants a chance at tag team gold. Even the match I’m not super excited about (US title fatal 4 way) has a chance to be good, especially if the crowd is behind Rusev. To sum it up, WrestleMania will be two things: very long and very good. Here are five matches that have the most potential to steal the show, as well predictions for each match. After WWE put on the fantastic Cruiserweight Classic, hopes were high for 205 Live. The product didn’t translate well, and it looked especially doomed when Enzo Amore became champion. Instead of focusing on the rare athleticism that the cruiserweights offered, 205 Live tried to make it storyline driven. It didn’t work, so Vince McMahon put HHH in charge to try and freshen things up. The results have been wonderful, and the Cruiserweight Title Tournament brought the product back to the greatness of the Cruiserweight Classic. While it would be great to have the finals on the main card, Mustafa Ali vs. Cedric Alexander is going to be bonkers no matter where it’s placed. Alexander and Ali both thrive when they’re able to focus on their athletic talent, and that’s exactly what the title tournament has allowed them to do. Each of their three matches in the tournament have been exciting, and with the final match culminating at WrestleMania, these two should be going all out. From an athletic standpoint, there’s no reason this match shouldn’t be the match of the night. The one benefit of being on the two pre-show is that these two should get plenty of time. Fingers crossed for a returning Neville to show up post match and tear both of them apart. People love to hate, but they don’t love to love. That’s the easiest way to sum up Ronda Rousey’s first 2+ months in the WWE. She has the potential to be a huge signing for WWE, and brings a legitimacy that few other performers have. I’m hopeful that the majority of the WWE Universe will give Rousey a shot, and a lot of that will have to do with her performance Sunday night. She’s been put in a great position: teaming with a fan favorite Olympic gold medalist against two long time, hated authority figures. If WWE keeps the storytelling simple and lets Kurt Angle do most of the leg work, this match could be epic. Regardless of how the match plays out, there is only one clear outcome: Ronda Rousey and Kurt Angle victorious. There are multiple matches on the Mania card that have a chance to be excellent in ring bouts. Near the top of that list is the triple threat for the IC title. Rollins and Balor are two of, if not the two best in ring performers on Raw. They had a hell of a match on Monday, and I can only see it getting better when you add in Miz. The Miz is enjoying easily the best run of his career, and while his in ring work can’t match up with Rollins/Balor, his character work is fantastic. While guys on Miz’s level don’t always need a championship, Miz having the belt makes all his talking points click. His character would seem hollow with the strap not on his shoulder, which is what makes this match so hard to predict. WWE loves moments, especially at WrestleMania, and if there’s one guy in need of a big moment, it’s Finn Balor. Miz and Rollins have had their moments, but Balor has been stuck in a rut since relinquishing the Universal title one night after winning it. I’m going with Balor to win and carry on the workhorse legacy the IC title deserves. While Alexa Bliss vs. Nia Jax has the emotional weight behind it, Charlotte vs. Asuka is the biggest dream match in the women’s division. Asuka has never been defeated in NXT/WWE, dating back to October 2015. Charlotte has been the standard bearer for the Women’s Revolution. Sasha/Bayley might have had better matches and more personal stories, but Charlotte has always been portrayed as the alpha. She won the old Divas championship. She won the Raw women’s title four times and will be the reigning, defending Smackdown women’s champion heading into this year’s Mania. Asuka will easily be Charlotte’s toughest challenge, and you also have the added intrigue of Asuka’s incredible winning streak. I’m a fan of keeping Asuka undefeated forever, but how do you have her win the Smackdown title while still on Raw? Both women’s divisions are paper thin, and I don’t think having Asuka switch to Smackdown is the right call. If there’s any current main roster star that should defeat Asuka, it’s Charlotte. I have very little confidence in this prediction, but I’m going with Charlotte to retain. AJ Styles and Shinsuke Nakamura were the main event of Wrestle Kingdom 10 in ’06. While they probably won’t be the main event of WrestleMania 34, they’re my pick to have the match of the night. Styles has been the best wrestler in WWE for awhile now, and Nakamura is a guy who rises to the skill level of his opponent. I’m so glad WWE kept this match one on one, as Styles and Nakamura deserve this spotlight. There has been speculation that Styles is injured, but it doesn’t seem serious enough to limit the match. With the WWE Network replacing the old pay per view format, match times are no longer an issue. That’s great news for these two, as they should have enough time to tell a great story and put on the match of the night. Similar to Finn Balor, Nakamura hasn’t had his big moment on the main roster yet. 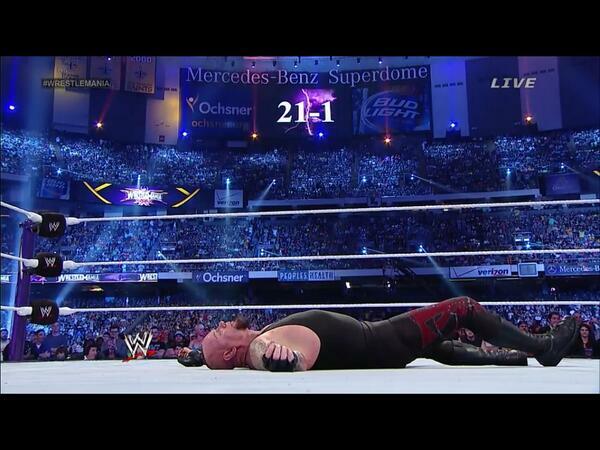 Winning the Royal Rumble was huge, but a WrestleMania moment is on a totally different level. Styles has carried the torch valiantly, but I think this is Nakamura’s time. I’m picking Shinsuke to become the new WWE champion. Roman Reigns defeats Brock Lesnar for the Universal title. Some people might get mad, but this is the logical ending for this story. Hopefully Lesnar goes to UFC and we can get the champ on Raw full time. Rusev wins the US title fatal four way. This one is a no brainer for me. Rusev is one of the most popular guys on the roster, even though he’s used idiotically. RUSEV DAY is one of those simple, classic catchphrases that the crowd loves, and Rusev is a skilled and charismatic performer. You can’t have Rusev lose on RUSEV DAY. Nia Jax defeats Alexa Bliss for the Raw women’s title. Bliss has been great in her role, but she needs to get rag dolled here. Nia should win in dominant fashion. Braun Strowman and his mystery partner defeat The Bar for the Raw tag titles. I have no clue who Strowman’s partner is, but I’m excited to find out. If I had to guess, I would pick Elias or a reincarnated Bray Wyatt. A mystery team won the tag titles last year (Hardy’s) and I think it happens again this year. The Raw tag division is not in good shape, and at the very least Braun Strowman and his mysterious friend can make it more exciting. The Usos retain over Bludgeon Brothers and New Day. I love The Usos and never want them to lose, hence my pick. Kevin Owens and Sami Zayn defeat Shane McMahon and Daniel Bryan. Firstly, how great is it that Daniel Bryan is back wrestling in a wrestling ring? I’m so happy for him. 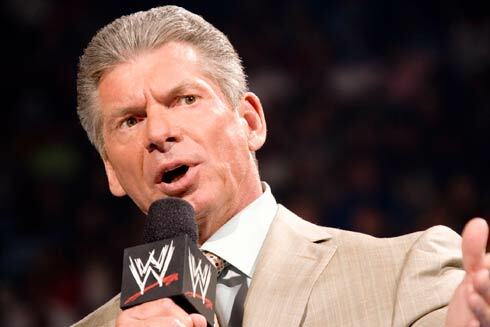 Secondly, never trust a McMahon. I hope the story they tell is that Shane, Kevin and Sami have been in cahoots this whole time. They went through all this trouble to get Daniel Bryan back into the ring so they could take him out 3 on 1. I can’t think of a better way to get crowds to turn on Zayn and Owens than to have them ruin Daniel Bryan’s WrestleMania comeback. John Cena has been on Raw for the past month calling out The Undertaker. Taker has been killing Cena with silence and has yet to accept Cena’s WrestleMania challenge. Will The Deadman show up in New Orleans? Will the two titans of WWE have an actual match? Your guess is as good as mine. What I do know is that this segment will get a ton of time, most of which will be a John Cena promo. WrestleMania has become a spectacle on it’s own, so it wasn’t necessary for The Undertaker to show up on Raw and officially accept Cena’s challenge. Fans are going to tune in regardless, but this has still be an odd storyline. I picked Samoa Joe to win the Andre the Giant Battle Royal, but I don’t think his night ends there. I think Joe either comes out instead of Taker, or comes out after Taker appears and takes both guys out. Samoa Joe is the real deal, and although he’s been hurt, giving him a big WrestleMania moment with John Cena and The Undertaker would be awesome. With Undertaker probably calling it a career I can safely say that he is the greatest of all time. He has nothing left to accomplish and nothing left to prove. Isn’t that what a successful career should feel like? Shouldn’t a successful career look exactly like the picture above? While clearly in pain from the brawl he just had with Lesnar he also looks at peace. At peace with his wrestling career and at peace with himself. His life’s work was to entertain us in which he successfully accomplished time and time again. Here’s to you, Undertaker, may your legacy Rest In Peace. 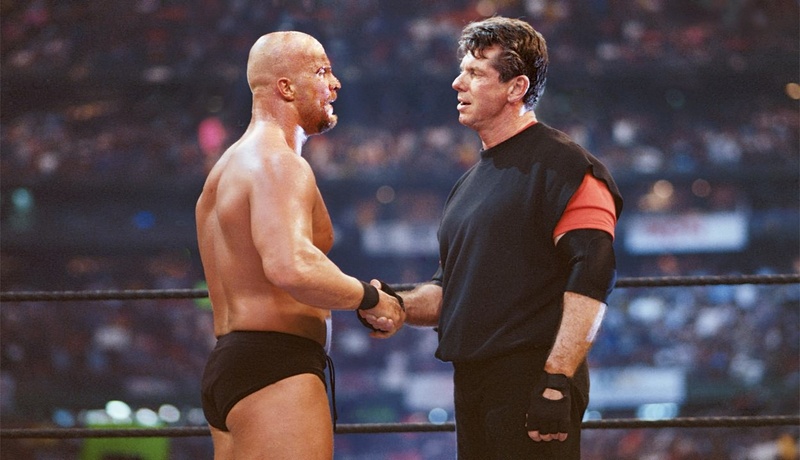 It’s not really fair to pick Vince McMahon for “Badass of the WEEK”, because in reality Vince is Badass of the century, maybe millennium. Laying in my bed last night I tried to come up with how I was going to tackle the feat of fitting all of Vince’s Badassery into one blog post. In all honesty it’s impossible, so I found some pictures to help tell the story. Father, grandfather, devoted husband, billionaire, philanthropist, professional wrestler, CEO, sports entertainment visionary, marketing genius, and television pioneer are only a fraction of the things that describe Vinnie Mac. 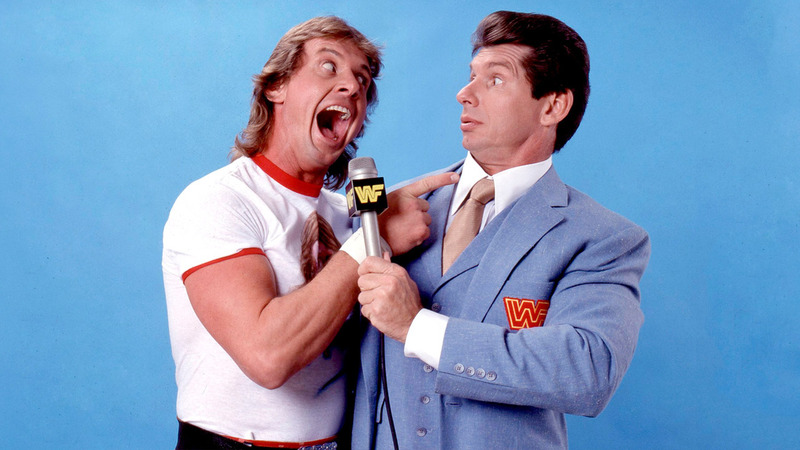 On the eve of Vince’s baby, Wrestlemania, lets all sit back and remember who made professional wrestling what it is today. Who took small territories and raised them up to the world stage? Who created the longest running episodic television show in history? Who created a billion dollar industry while at the same time giving back every step of the way? Vince did all that PLUS more. 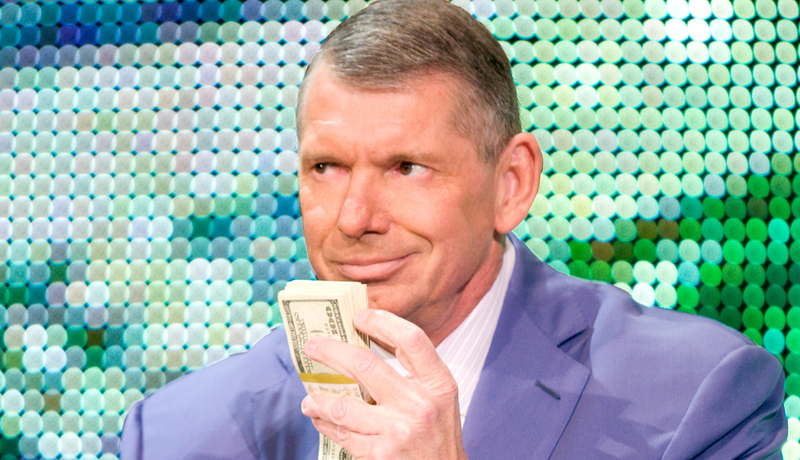 No matter what happens week to week in WWE my friends and I always remind ourselves one thing: “In Vince we trust”. 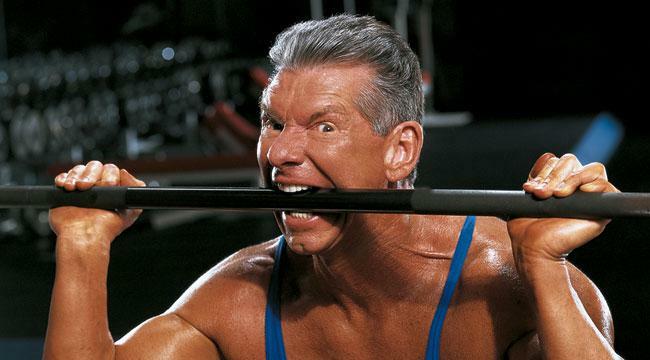 Vince McMahon is a badass. 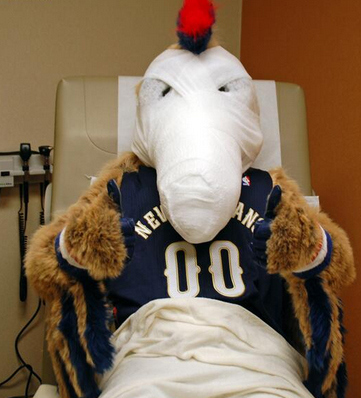 Apparently this is what the NBA has come to: Flopping and mascots getting reconstructive surgery. 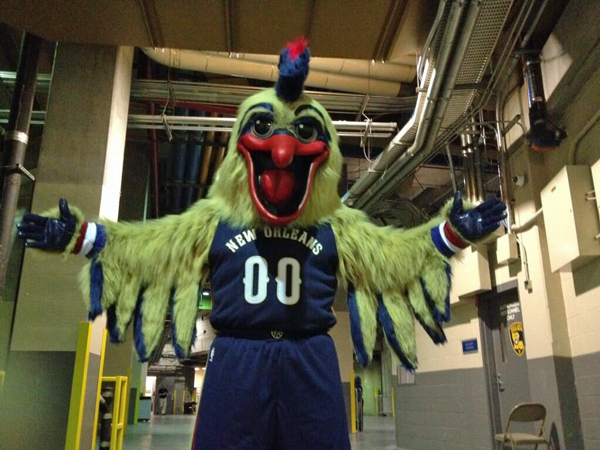 Good old Pierre teaching kids that if you are ugly and scary you can always just mess around with your face so people won’t run screaming from you. Now he just looks like Jay Leno.